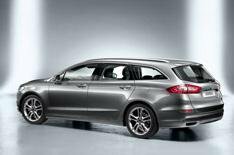 New 2013 Ford Mondeo Estate unveiled | What Car? The all-new Ford Mondeo Estate has been revealed ahead of going on sale in autumn 2013. It's the load-carrying version of the new Ford Mondeo, which was revealed earlier today. Full technical details of the new Mondeo Estate have yet to be revealed, but the hatchback version is around 80mm longer than the current model. The estate model is likely to grow by a similar amount and we'd expect a large load area, to help it compete against rivals such as the all-new Mazda 6 Estate, Vauxhall Insignia Sports Tourer and Volkswagen Passat Estate. The new Mondeo is the latest example of the One Ford strategy to develop global models. Concerns over the time needed to adapt the US-developed car for the European market have pushed back the on-sale date for the Mondeo from early 2013 to the autumn. Saloon, hatchback and estate models are expected to go on sale at the same time. Although the side profile and rear of the 2012 Mondeo Estate are similar to the current model's, the front of the car looks very different, with slimmer headlights and Ford's new higher 'trapezoidal' grille. New high-tech options include Sync, which features voice control and a Wi-Fi hotspot for up to five devices. The estate model offers the option of a new panoramic sunroof. New safety equipment includes inflatable rear seatbelts that are designed to reduce head, neck and chest injuries. Ford has confirmed that its 1.0-litre turbocharged three-cylinder Ecoboost petrol engine will be available in the new Mondeo. It's likely to be offered with various power outputs, starting with the 123bhp version that's already available in the Ford Focus. There'll be a range of upgraded diesel engines, and CO2 emissions for the estate could be reduced to around 110g/km. Prices have yet to be confirmed, but we'd expect a small increase over the current car, so the entry-level estate model should cost just under 20,000.